3) damno - damages, monetary loss. The meaning of this maxim is injury to legal right without any monetary loss. This is actionable, because there is violation of legal right, even though plaintiff suffer no loss in term of money and defendant is liable. 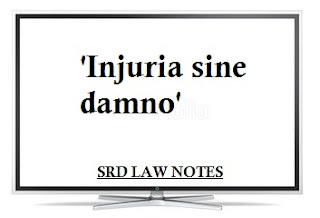 In simple words, Injuria sine damno means Injury without damage or it means infringement of an absolute private right without any actual loss or damage. whenever there is an invasion of legal right, the person in whom the right is vested is entitled to bring an action and may recover damages, although he has suffered no actual harm. In such case, the person need not prove the actual damage caused to him. Example Trespass to land or property. Suppose 'A' enter a private compound without permission of the owner just for asking water, here the moment 'A' step in, A commit trespass and action can lie against 'A' even no actual damage is caused. 1) Ashby v/s White, 1703. Plaintiff was legal voter ,his name was there in voter list.defendant was a returning officer, i.e. incharge of election. Deft. Refused the plaintiff to offer or to tender his lawful vote to his candidate. Plaintiff sued Deft.for compensation even though no loss is caused in term of money. Court held that Deft.is liable to pay compensation because he has violated legal right of plaintiff to vote. Even though plaintiff suffered no actual loss in term of money, or the candidate to whom plaintiff was interested got elected, defendant has committed a tort and therefore liable to pay compensation. 2) Ashrafilal v/s Municipal corporation of Agra, 9121. It is the similar case to Ashby v White. The name of plaintiff was deleted, dropped from voter list by the Deft corporation, so plaintiff couldn't exercise his right to vote . Plaintiff sued Deft.corporation for compensation. Court accepted the principal of Ashby v/s White e.g. injuria sine damnum. Plaintiff was an account holder or customer who was having amount in his account he went to withdraw money by Self cheque. Though there was sufficient amount in his account, the Deft banker refused to pay plaintiff without any reason. So plaintiff filed a suit against Deft banker for damage. Even though plaintiff suffered no monetary loss Deft.is liable for refusing customers cheque and therefore committed tort.